We offer classes for children who are homeschooled on Mondays at 1 p.m. during the school year sessions. 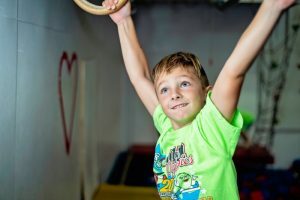 The classes offered are Girls Gymnastics for 5 to 8-year-olds, Girls Gymnastics and Tumbling for 7-year-olds and over and Co-Ed Ninja Warrior Obstacle Course for 5-year-olds and over. Homeschool classes are not offered during the summer session. These classes will re-open in August for the 2019-2020 school year sessions. Homeschool girls gymnastics is a 55-minute class in our Big Gym for girls 5 years old to 8 years old. The goal of the girls gymnastics program is to teach the proper drills and skills utilizing the gymnastics equipment and the Ninja Warrior obstacle course. Girls in this class are reaching towards accomplishing specific goals on all events: cartwheels on the floor, pullover on bars and straddle jumps on the trampoline. This is a high-energy program that places great emphasis on proper form, technique, skill progression and fun. Homeschool Girls Gymnastics and Tumbling is a combination of gymnastics and tumbling for girls 7 years old and over. The goal of the girls gymnastics program is to teach the proper drills and skills utilizing the gymnastics equipment and the Ninja Warrior obstacle course while also focusing on learning and improving tumbling skills. This is a high-energy program that places great emphasis on proper form, technique, skill progression and fun. This class is taught by our expert staff who can coach to a variety of skill levels in one class. Ninja Kids is a 55-minute class in our Big Gym for homeschool boys and girls 5 years old and older. You’ve seen it on TV, but now your child can try to conquer the two warped walls we have at OKG! Our multi-obstacle course is designed to teach coordination, critical thinking and improve strength. The ninja elements are always changing and surprising students with the next challenge. With each class, your child will grow confidence and self-esteem as they learn to master any challenge they face.